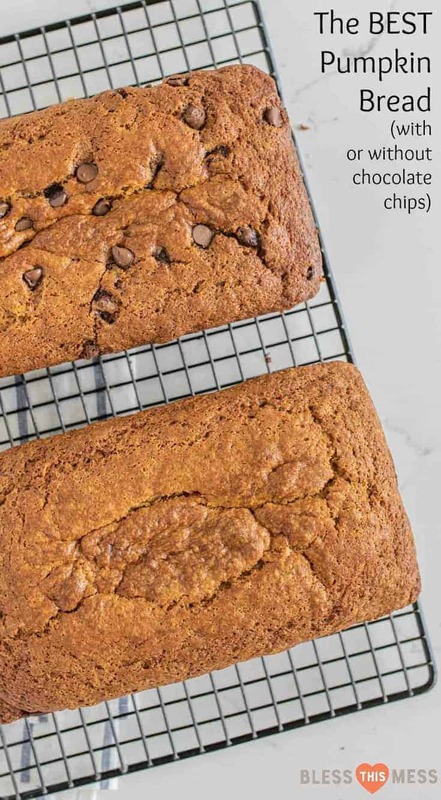 This is THE Perfect Pumpkin Bread recipe made with or without chocolate chips. It’s sweet and moist but never gummy. You’ll make it over and over again. I. Love. This. Pumpkin. Bread. It’s the best recipe out there and one that you’ll make again and again. The bread always cooks so nicely with a firm crumb, a sweet little crust on the outside, and no gumminess. I like that this recipe makes two loaves (they freeze well, FYI!) and I like that you can choose to add chocolate chips or not. I normally will scrape half the batter without chocolate chips into one pan, stir chocolate chips into the remaining batter, and then add that to the second pan. It’s the best of both worlds for my family who is split down the middle when it comes to team chocolate and team no chocolate. 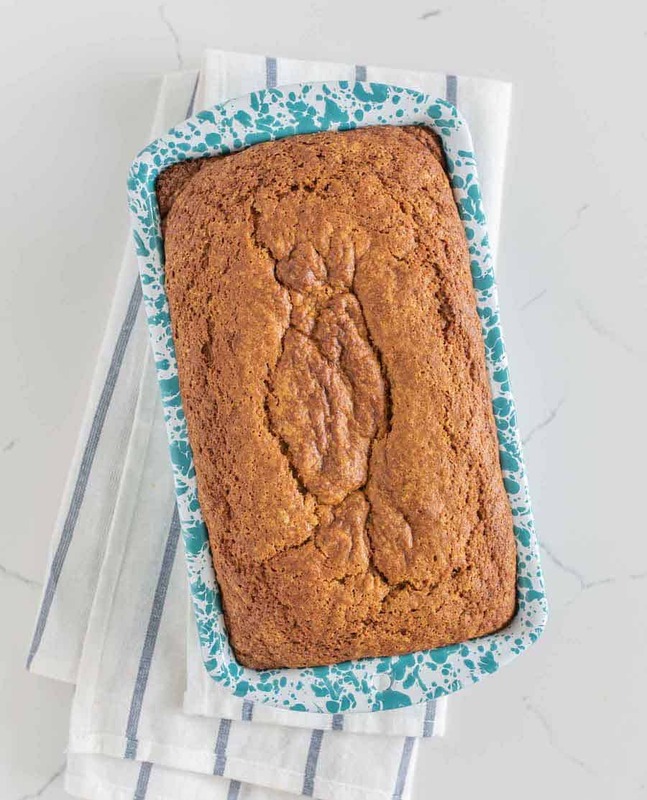 This bread is the perfect combination of sweet and spice with just the right amount of pumpkin flavor. It’s a dessert in my book, and oh-so-good! I can’t wait for you to make this so you can understand just how perfect it is. 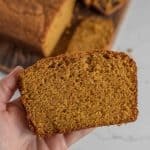 I dare say this is the best pumpkin bread recipe ever, but you’ll have to judge that for yourself. This recipe is part of Pumpkin Week! A week I dedicate to all pumpkin recipes on the blog. 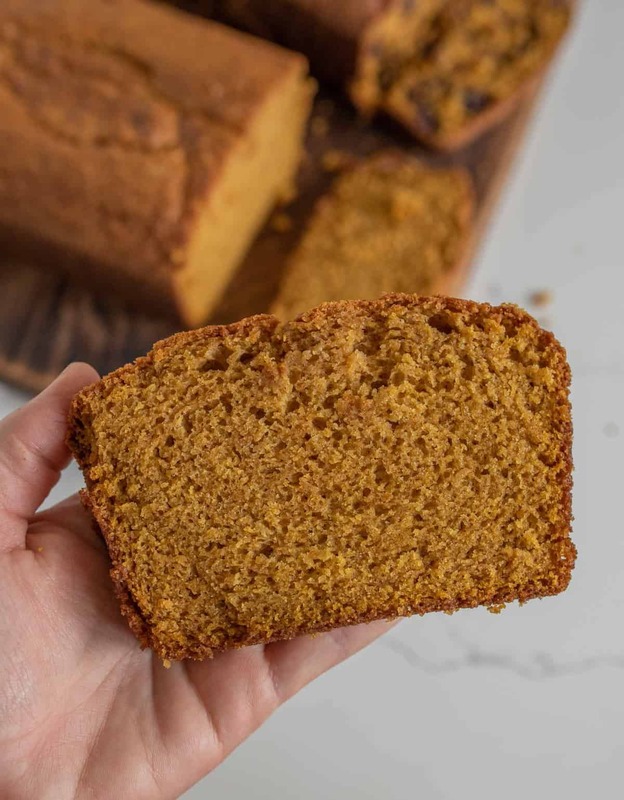 I have SO MANY pumpkin recipes in my archives that it took me a little while to decide what I wanted to make this year. 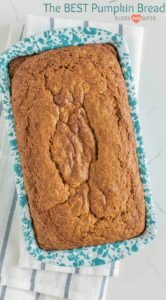 I realized that even though I have multiple pumpkin muffin recipes on Bless this Mess, I hadn’t shared my favorite pumpkin bread recipe. I’m so glad we could remedy that problem today. It’s a recipe you are going to make again and again. You can reduce the sugar to 2 1/2 cups for a less sweet bread without any ill effects. You can use the oil of your choosing or substitute some of the oil for applesauce with great success. Half cup applesauce and a half cup oil works just great. This bread freezes very well. Let the bread cook completely, wrap in plastic wrap and then foil. Freeze for up to two months. Remove from freezer and let thaw at room temperature before slicing and serving. 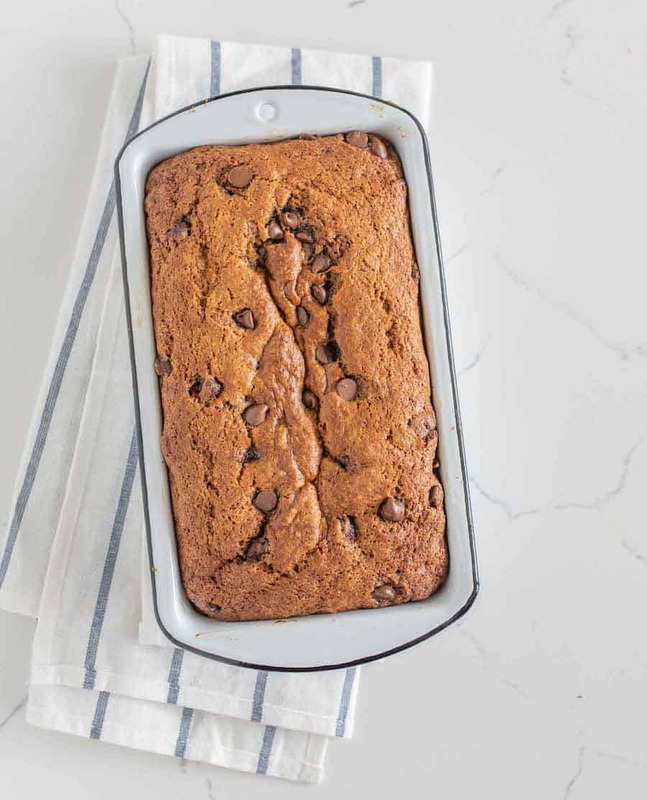 You can use half the batter in a loaf without chocolate chips, add a cup of chocolate chips to the remaining batter, and then place it in the pan. 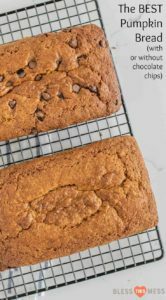 It’s very easy to make one loaf with chocolate chips and one loaf without. I love my enamel bread pans! You can find them (in a million color options!) here. 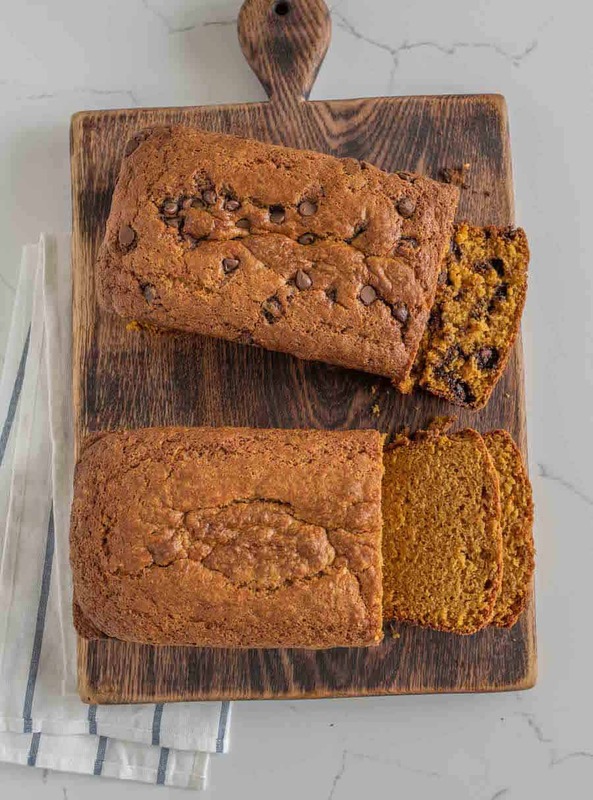 This is THE Perfect Pumpkin Bread recipe made with or without chocolate chips. It’s sweet and moist, but never gummy. You’ll make it over and over again. Preheat the oven to 350 degrees and grease two 9×5-inch loaf pans well, set aside. In a large bowl, mix together the flour, wheat flour, sugar, baking soda, cinnamon, nutmeg, and salt. In a smaller bowl, add the pumpkin puree, oil, eggs, and water or buttermilk. Stir well to combine. Add the pumpkin mixture to the dry ingredients and stir until the mixture just comes together. Divide the batter evenly among the two prepared pans and smooth the top. Bake for 50-70 minutes until a toothpick inserted into the center comes out clean. Let cool on a wire rack for 15-20 minutes, then run a knife between the edge of the bread and the loaf pan. Remove from the pans and finish cooling on wire racks. You can use half the batter in a load without chocolate chips, add a cup of chocolate chips to the remaining batter, and then place it in the pan. It’s very easy to make one loaf with chocolate chips and one loaf without. This recipe is from Mel’s Kitchen Cafe. Love her and love her site! So much pumpkin love to share and I’m more than happy to spread that love. Want even more pumpkin inspiration? Just type “pumpkin” into the search bar at the top of the page. Thank you for enjoying pumpkin week with me!